In the presence of some anemias, the body increases production of red blood cells (RBCs), and sends these cells into the bloodstream before they are mature. These slightly immature cells are called reticulocytes, and are characterized by a network of filaments and granules. 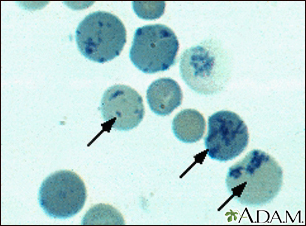 Reticulocytes normally make up 1% of the total RBC count, but may exceed levels of 4% when compensating for anemia.